You walk into a restaurant and get an immediate sense that you should leave. You are about to step onto an elevator with a stranger and something stops you. You interview a potential new employee who has the resume to do the job, but something tells you not to offer a position. These scenarios all represent Left of Bang, the moments before something bad happens. But how many times have you talked yourself out of leaving the restaurant, getting off the elevator, or getting over your silly “gut” feeling about someone? Is there a way to not just listen to your inner protector more, but to actually increase your sensitivity to threats before they happen? Legendary Marine General James Mattis asked the same question and issued a directive to operationalize the Marine Corps’ Combat Hunter program. 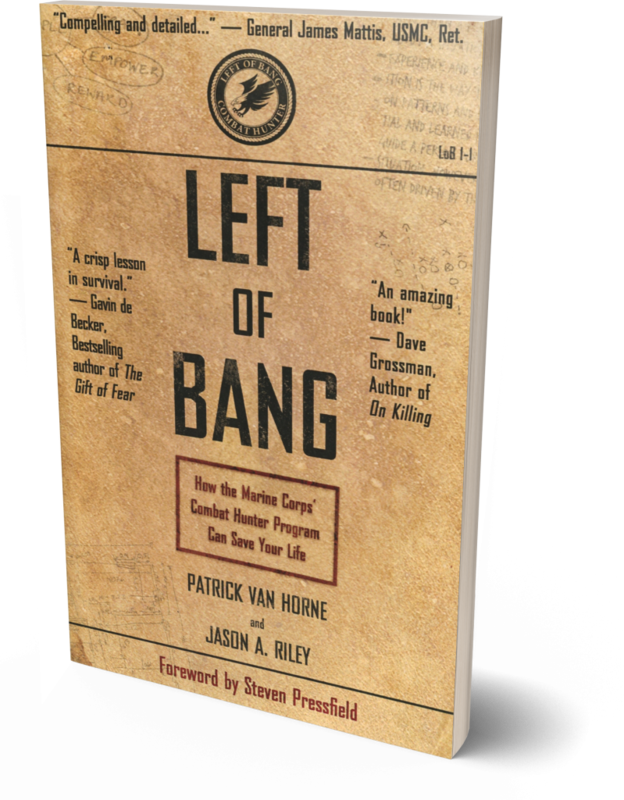 A comprehensive and no-nonsense approach to heightening each and every one of our gifts of fear, Left of Bang is the result. - General James Mattis, USMC, Ret. These scenarios all represent Left of Bang, the moments before something bad happens. But how many times have you talked yourself out of leaving the restaurant, getting off the elevator, or getting over your silly “gut” feeling about someone? Is there a way to not just listen to your inner protector more, but to actually increase your sensitivity to threats before they happen? Legendary Marine General James Mattis asked the same question and issued a directive to operationalize the Marine Corps’ Combat Hunter program. A comprehensive and no-nonsense approach to heightening each and every one of our gifts of fear, Left of Bang is the result. Patrick Van Horne is the founder and CEO of The CP Journal, a behavioral analysis training company. His firm provides training support to the U.S. military, federal and local law enforcement agencies and the private security industry. Van Horne is a former infantry officer in the United States Marine Corps, earning the rank of Captain before returning to the private sector. His company's training programs are focused on teaching people how to prevent violent acts from occurring and finding attackers hiding in plain sight. Jason A. Riley has served as a Marine Corps infantry officer since 2003, and is currently a Major in the Reserves. While on active duty, he served with 1st Battalion, 2nd Marines and deployed twice to Iraq. He also served as a Combat Advisor to the Afghan National Army in an Eastern province of Afghanistan. From 2009 until 2011, Jason served with the Marine Corps' Combat Hunter program, where he led a team of instructors, developed curriculum and courses, and taught behavioral analysis. He currently serves with a reserve unit in Southern California, and is enrolled in Command and Staff College. He is also a PhD Candidate, has published in academic journals, and has co-authored two books, including Left of Bang.